Easily grown in average, medium, well-drained soils in full sun to part shade. Tolerates poor soils. Freely colonizes by root suckers to form dense thickets. 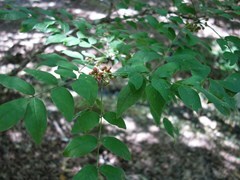 Zanthoxylum americanum, commonly called prickly ash, is an aromatic, spiny, thicket-forming deciduous shrub or small tree that, as the common name suggests, resembles (particularly in leaf) an ash with prickles. It is not an ash, however, but a member of the citrus family (Rutaceae) and is closely related to the also spiny hardy orange, Poncirus trifoliata. Prickly ash is a Missouri native plant that typically occurs on bluffs, upland rocky hillsides, open woods, moist ravines and thickets in most of the State except for the Ozark region (Steyermark). It is most often seen in the wild as an 8-10' tall multi-stemmed shrub. However, it will grow larger and is occasionally seen as a small tree up to 25' tall. Compound, odd-pinnate, dark green leaves (to 1' long) have 5-11 leaflets each. Stems and leaves have sharp prickles to 1/2" long. Male and female flowers appear on separate trees (dioecious) in axillary clusters (cymes) on old wood. Flowers bloom in spring before the leaves emerge. Flowers are greenish-yellow, fragrant and inconspicuous, but are quite attractive to bees. Female flowers give way to clusters of rounded, reddish-brown, berry-like fruits (follicles) which mature in late summer (1-2 shiny black seeds per follicle). Fruits may be the best ornamental feature. All parts of this plant (leaves, flowers, fruit, bark and roots) are aromatic (lemony fragrance). Sometimes commonly called toothache tree because Native Americans chewed the bark or fruits (producing a numbing effect) for relief from toothache pain. Native Americans also prepared a variety of medicinal decoctions from the bark and roots for treatment of such problems and fever, coughs, gonorrhea, rheumatism and external wounds. Formerly known as Xanthoxyum americanum. Genus name comes from the Greek words xanthos meaning yellow and xylon meaning wood for the color of the heartwood of some species. No serious insect or disease problems. Prickly ash is a food plant for larvae of the giant swallowtail butterfly, and considerable defoliation may occur in some years. This tree or shrub has somewhat limited ornamental value. Good for hedgerows, screens, naturalized woodland areas or integrated into native plantings.